It was freezing. And the wind had howled all night… despite this my wake-up call at 5:15 am had me up and waiting to be escorted to the dining area for coffee in no time. I was the only one braving the cold that morning – sometimes you’ve just got to do what you got to do. Others might call it FOMO (fear of missing out)… and miss out they certainly did! We had arrived at Thanda Safari two days previously on a gloriously warm and sunny day. Just what you’d expect in these northern reaches of KwaZulu-Natal. 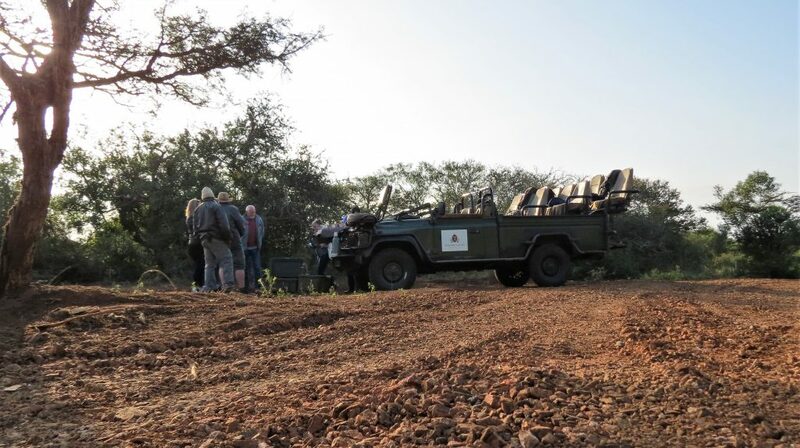 After a quick welcome drink and the obligatory paperwork I clambered onto the waiting game viewing vehicle with Matthew and Zakes, our ranger and tracker, and three other guests. Soon all thought of packing and traffic was gone and I was immersed in a tale of harems, allogrooming and territorial males. Impala are a somewhat overlooked species in many game reserves, especially with so much focus on finding the Big Five, so it was a pleasure to sit quietly and watch the herd. 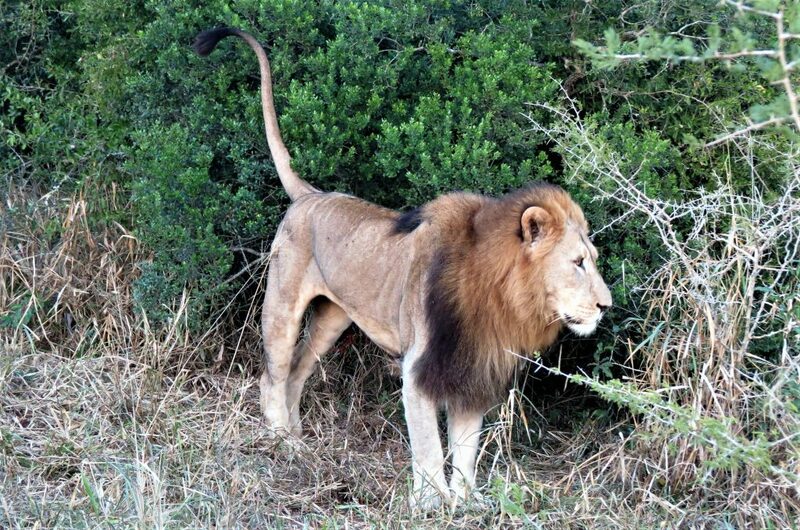 Ever alert, the dominant male kept an eye on us, the surrounding and his lovely harem, who at this point were being de-ticked by ox peckers and groomed by one another. 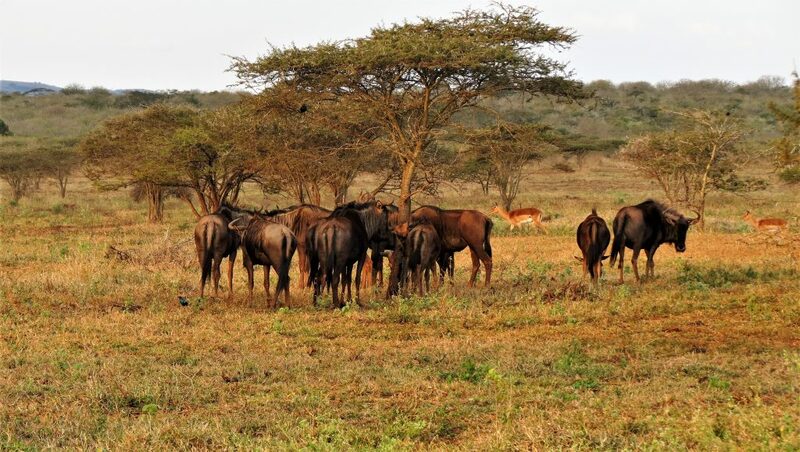 Matthew explained that they were allogrooming – an important means of social interaction where females typically groom related impalas, each partner grooming the other numerous times. 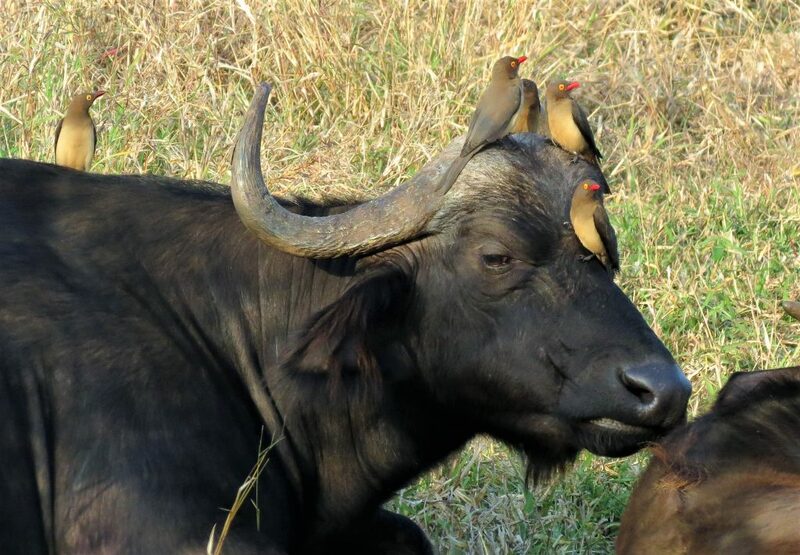 In a male bachelor herd they would generally associate with unrelated ones. 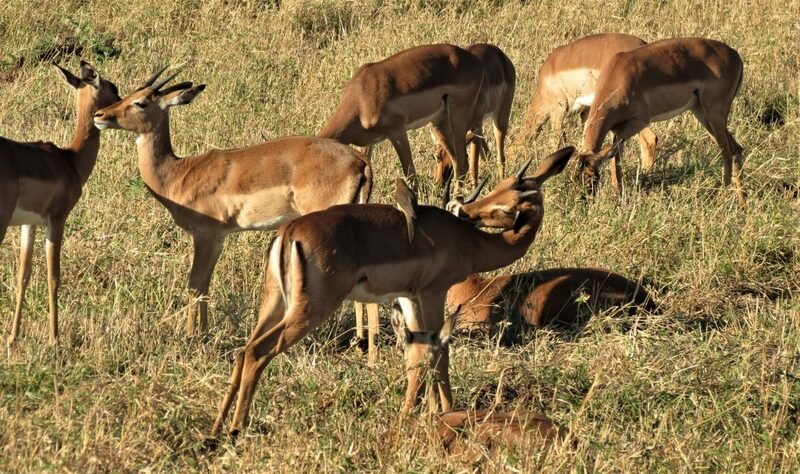 The interesting thing is that impalas seem to be the only ungulate to display this behaviour. We watch a fiscal shrike (aka Jackie hangman or butcher-bird) fly off with what looked like a spotted bush snake in its beak, probably to impale it onto a thorn of one of the many Acacia trees in the area. 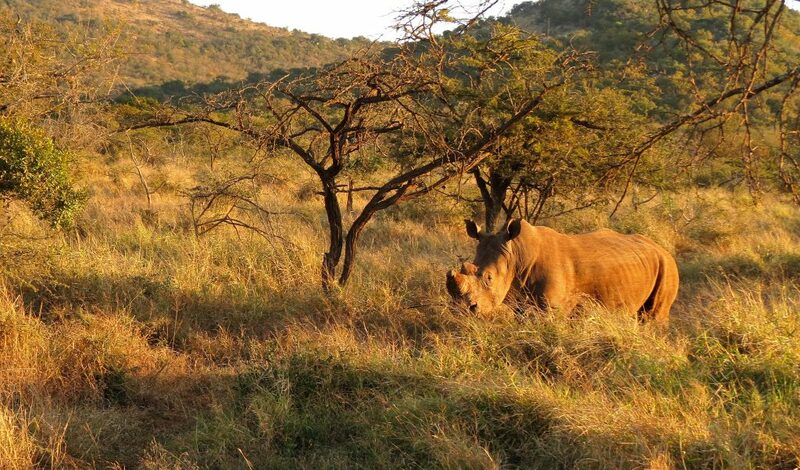 And smiled as a white rhino played ‘hide and seek’ with us ‘hiding’ itself behind a small slender tree, before deciding to show itself. 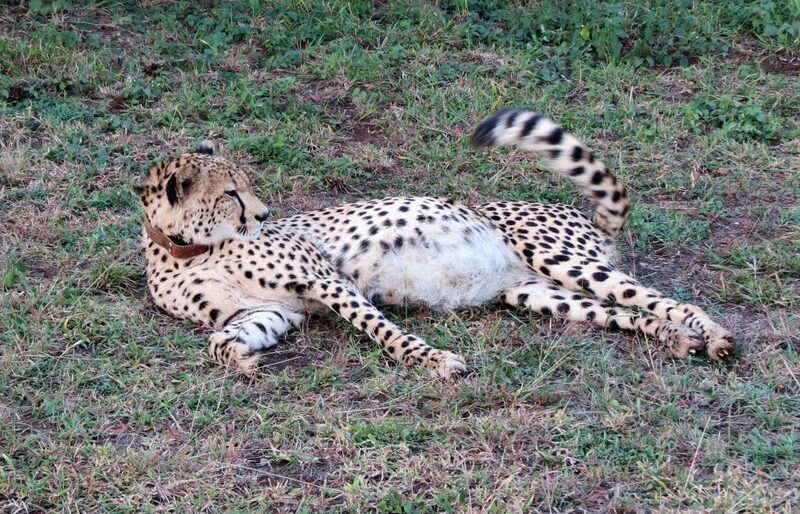 Cameras clicked rapidly as we watched a cheetah roll this-way-and-that, contentedly flicking its tail – I’m sure it must have been purring. Ever full of interesting information, Matthew tells that the cheetah is the only big cat that purrs, but that unlike other big cats, cannot roar. 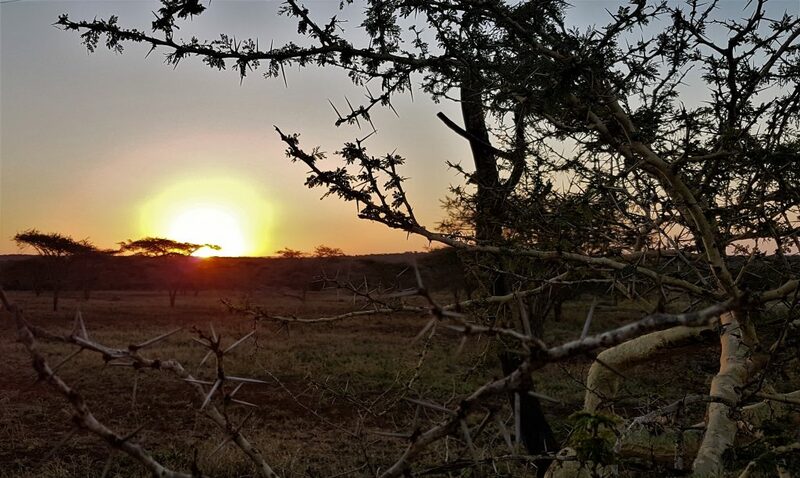 A good afternoon’s game viewing deserves a spectacular African sunset and the obligatory G&T – Thanda Safari didn’t disappoint on either. 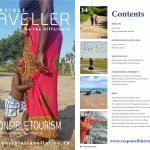 We were in Thanda Safari’s tented camp and my tent, with its ‘Out of Africa’ feel, had a wonderfully spacious bedroom, en-suite canvas bathroom and huge outdoor shower. 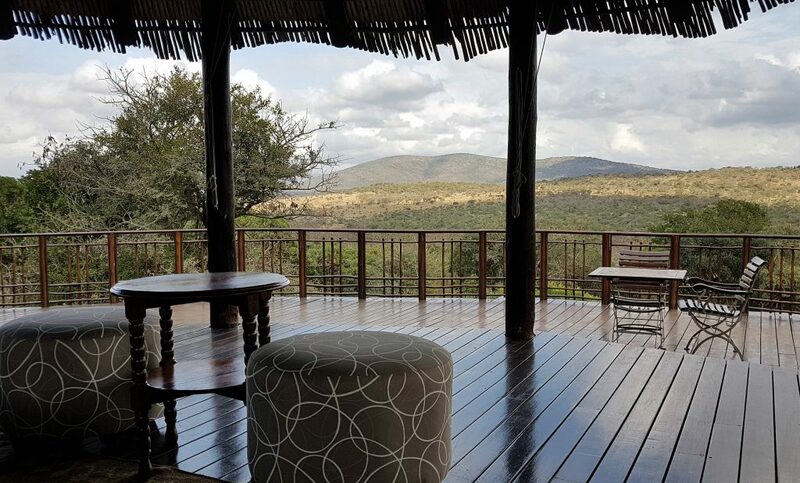 The private deck overlooking the valley offered the perfect spot to relax, binoculars in hand, watching the birds flitting in the bush and checking the distant hillside for ellies. 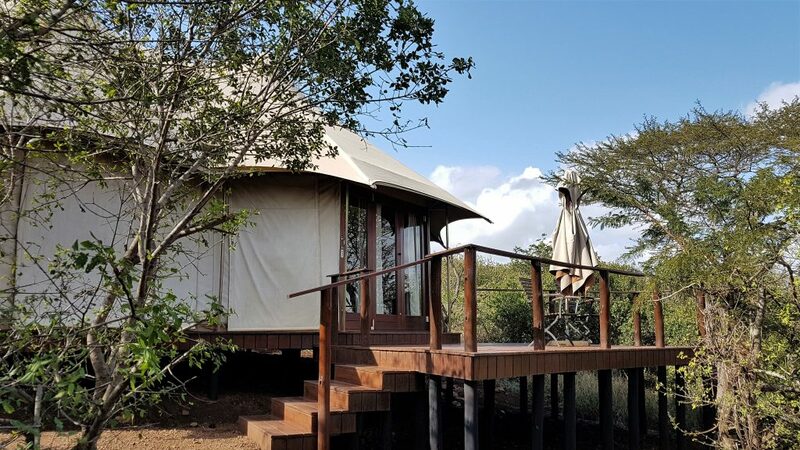 Thanda Tented is non-electrified, relying on limited solar and battery power with a few hours of generator to power the tents each day, and paraffin lamps to light the pathways by night. 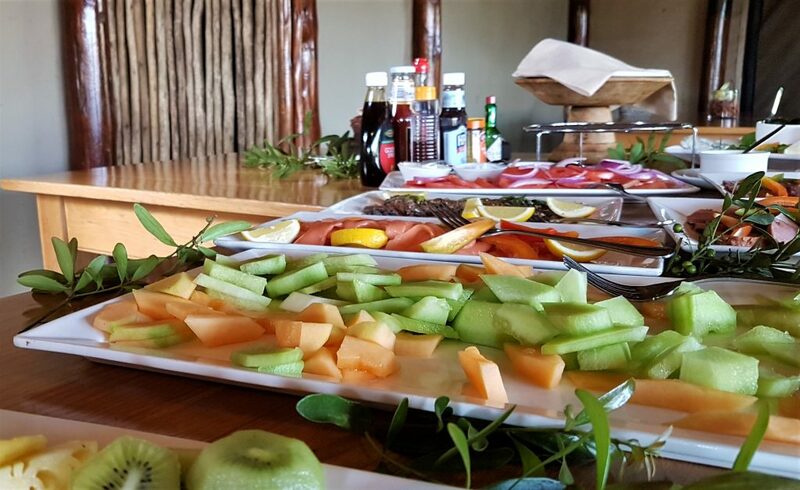 Meals at Thanda Tented include breakfast, a high tea before the afternoon game drive and dinner – either in the main dining area or the boma, weather permitting. 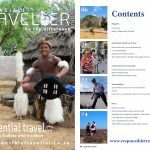 Leisure time between game drives can be spent napping in your suite, taking the opportunity to upskill with a few photographic lessons from resident photographer Christian Sperka or being wonderfully pampered at the safari spa. Needless to say, the nap and photographic lesson would have to wait for another visit, as I opted for a spa treatment… I could feel the stress of the previous weeks roll away as while I breathed in the subtle fragrances of orange and jasmine as the breeze from the open tent cooled the air. 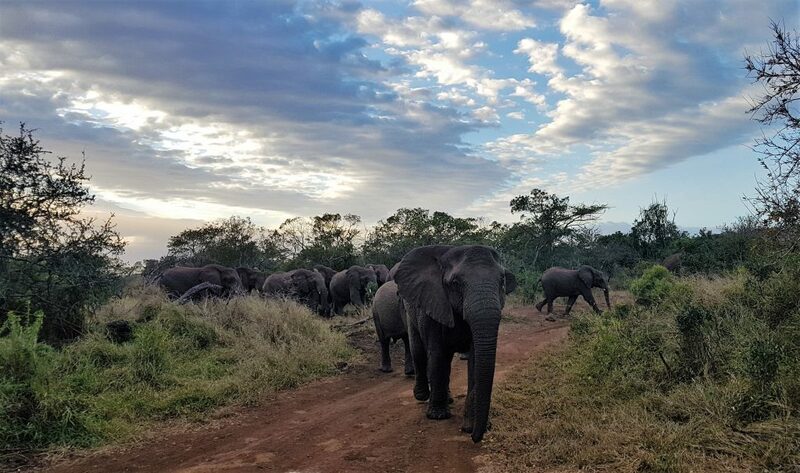 Driving through the rolling hills of this, the Zululand region, of KwaZulu-Natal one cannot help but be aware of the challenges rural Zulu communities face and checking in for a luxury safari experience could feel somewhat improper. 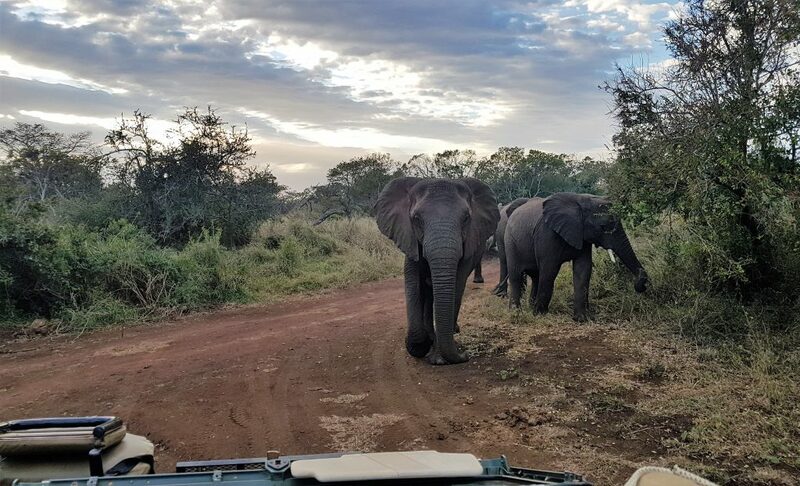 And it would be were it not for the ethos of responsible tourism that underpins every decision owners of Thanda Safari, Christin and Dan Olofsson make. 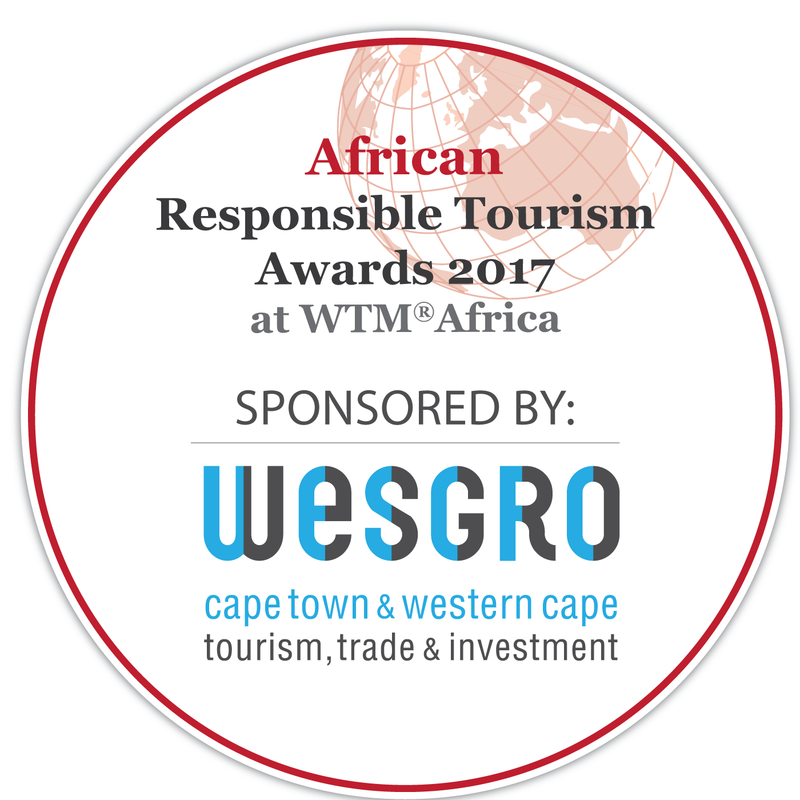 From the very beginning with their significant investment and commitment to creating employment, to their continuous work into the neighbouring communities, the rehabilitation of the land and the many conservation initiatives. Their love for Africa and the Zulu people is even reflected in the name – Thanda, means ‘love’ in isiZulu. 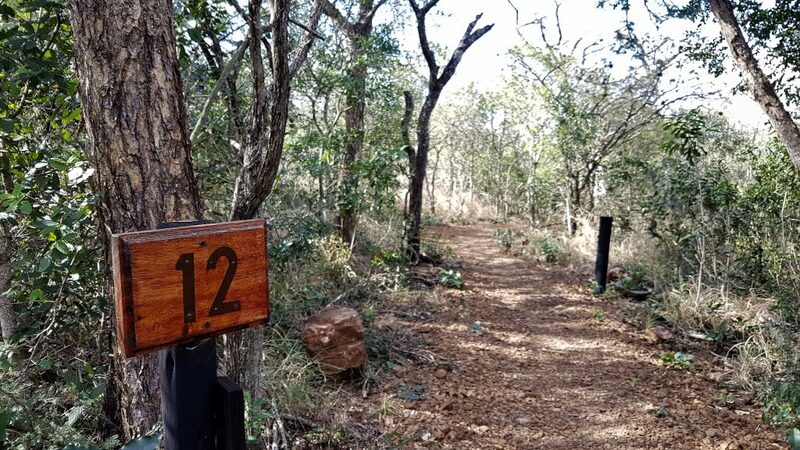 It is at our coffee break, and while is whisking up some bush coffee, we learn a little more about the land rehabilitation and game restoration projects at Thanda. Zakes, who has been at Thanda from its conception, tells us that the lush bushveld we now see was once overgrazed and unproductive farmland. 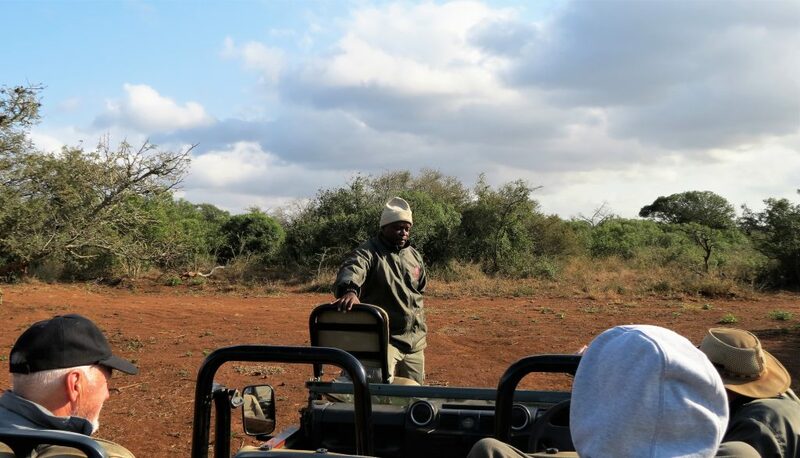 He also tells of the newest section of the reserve, the Mduna Royal Reserve. 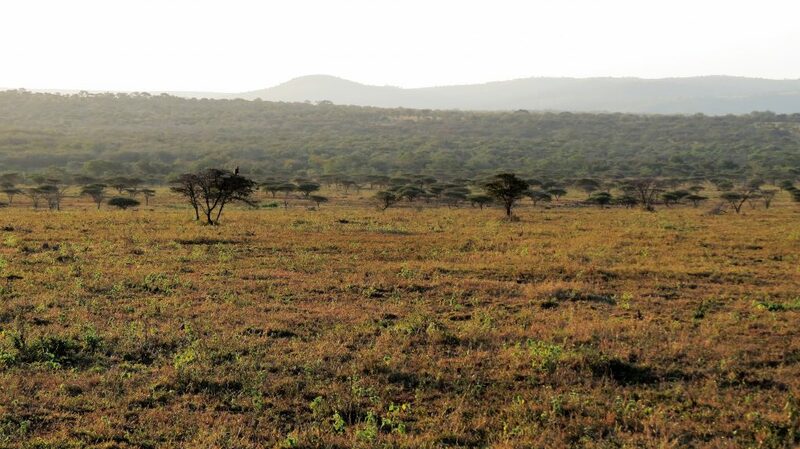 This is land held in trust for the Zulu people by the Zulu King Goodwill Zwelithini. 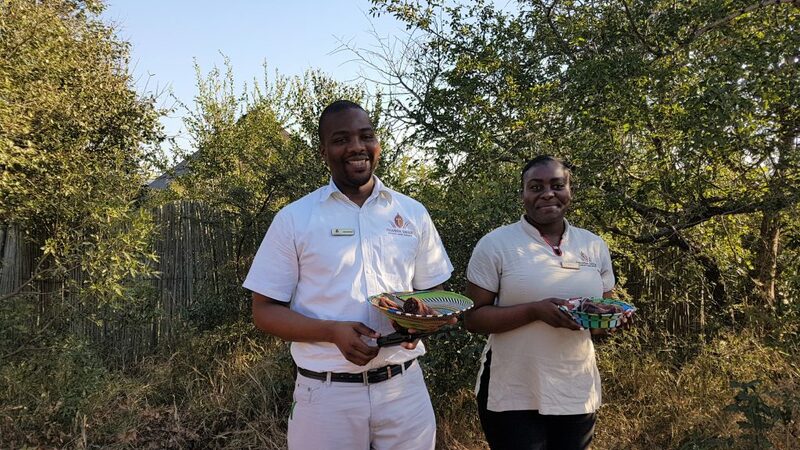 Mduna is a partnership between the Thanda Foundation, Ingonyama Trust and the Wildlands Conservation Trust. 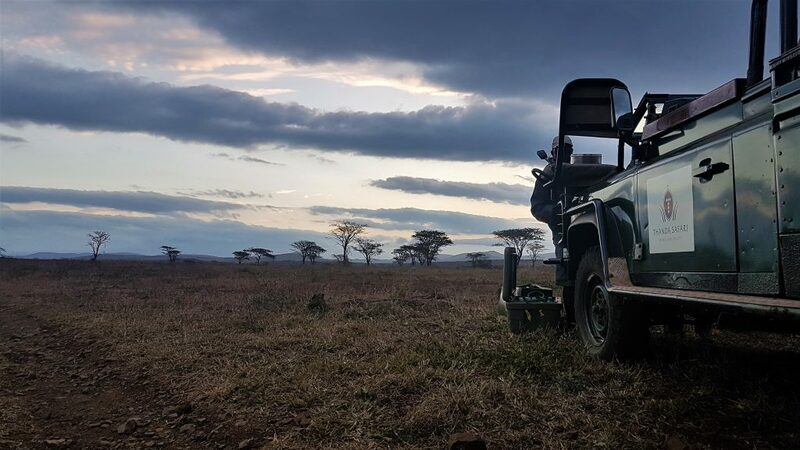 And that Thanda has committed to return this land to its wilderness state, to reintroduce and manage the wildlife, and to ensure security and anti-poaching measures. 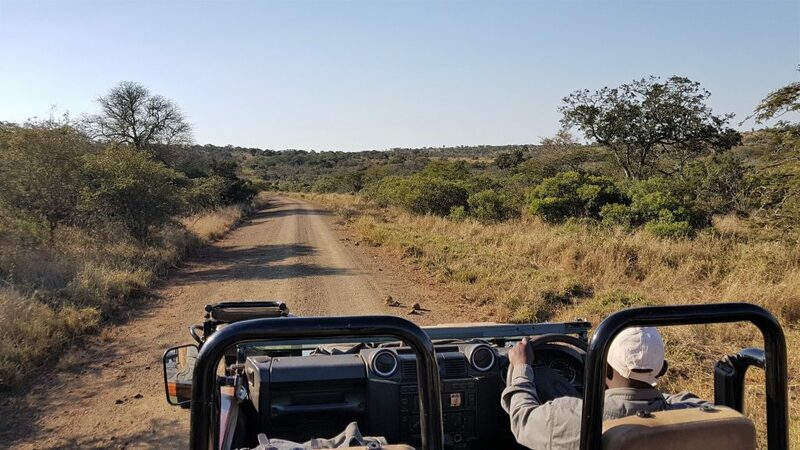 It was Zakes knowledge of the bush and traditional Zulu culture however that added another dimension to each game drive. He told of traditional remedies, passed down from one generation to another, and of bush skills like creating a toothbrush using a thin branch from a Blue Guarri bush (umNqandaqne) and using ash from the fire as toothpaste. 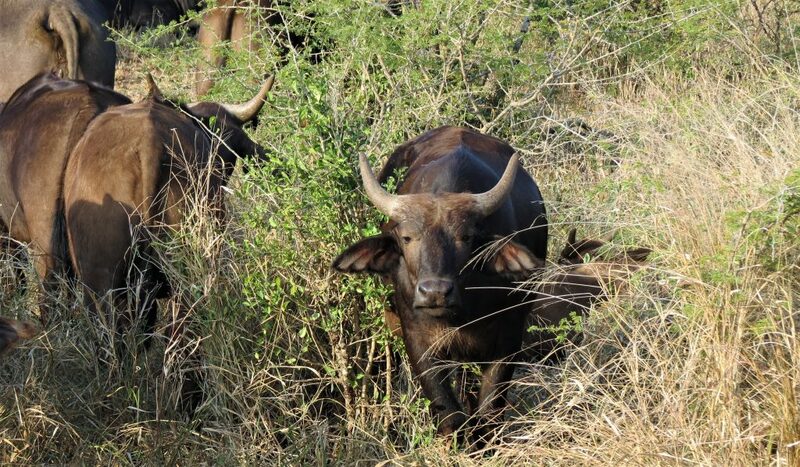 And Zulu traditions, like the significance of the buffalo thorn (Ziziphus mucronata) – it is used by family members to retrieve the spirit of the deceased from where he died. The chosen person goes to the place where their family member died carrying a branch of the spirit tree (as it is called by the Zulus), it gives the spirit something to hold on to where it is then taken back to the homestead where it is given a resting place near the family. 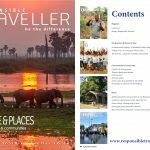 …to an unexpected change in weather that had us scuttling for the warmth and comfort of our tented ‘home’ after a brief and chilly sun-downer stop. 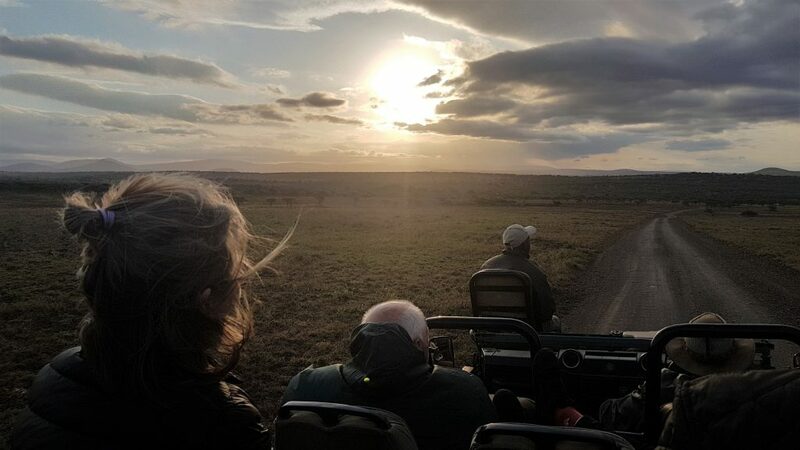 It was this unexpected weather (who expects horrid weather when on safari? Despite the fact that the weatherman would say ‘I told you so’) that had me up before sparrows ready to brave the cold. Matthew even gave me the option of a graceful exit. ‘No’, I told him, ‘I’m dressed and I’ve had coffee… and after all you never quite know what you might see.’ A serious case of FOMO right here! 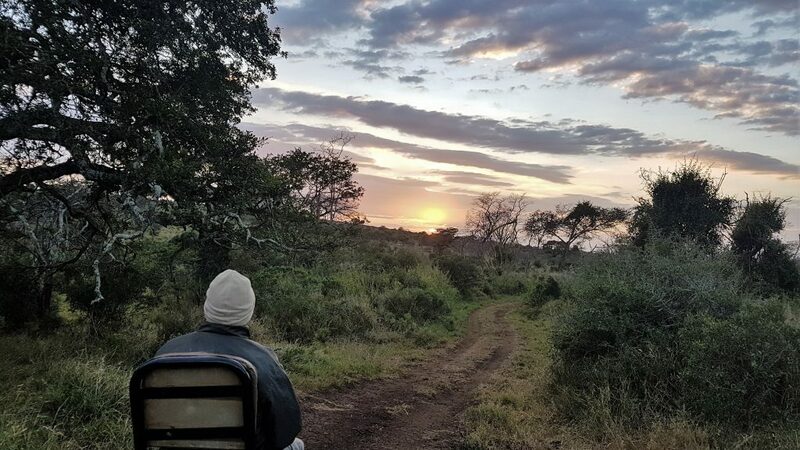 The guys had opted for low-lying riverine areas to escape the cold wind, we’d leisurely watched the sunrise, seen the odd nyala – even they were choosing the thickets to escape the weather, and were comfortable just chatting about all things bush related. 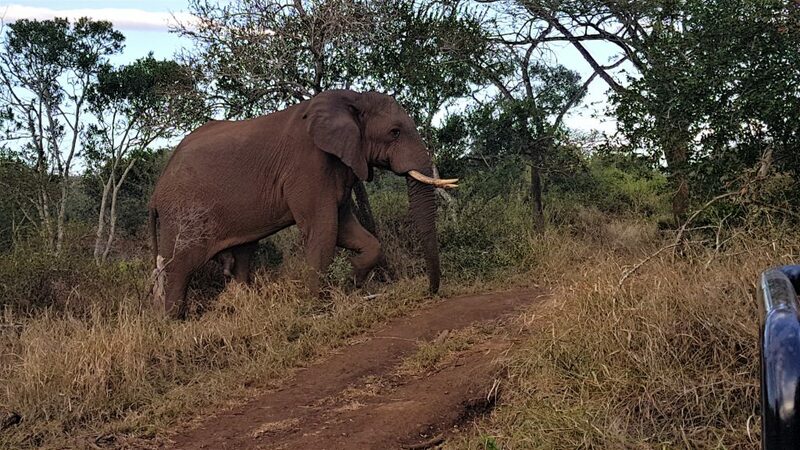 Suddenly Zakes whispered ‘elephant’, pointing across the ravine. We crossed over hoping to see them better, only to find they had crossed the other way, but Zakes said ‘don’t worry, go back and we’ll meet them on the other side’. They were headed in our direction, with some nimble manoeuvering Matthew had us out the way. But an elephant’s curiosity knows no bounds and soon there was a trunk sniffing the air around us, but not quite brave enough touch. Zakes and Matthew spoke to the elephant quietly, while I sat mesmerised enjoy every moment of this intimate experience. 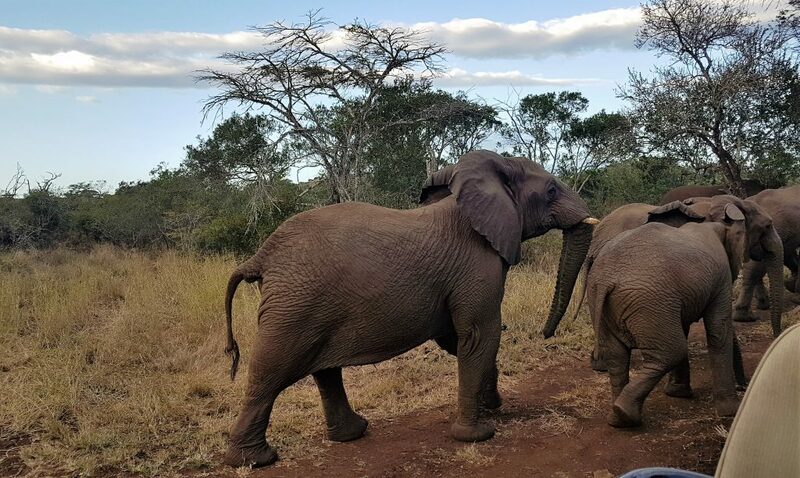 Once the moment had passed and the ellies had moved off Zakes told me that the African people regard the elephant with a very deep respect. 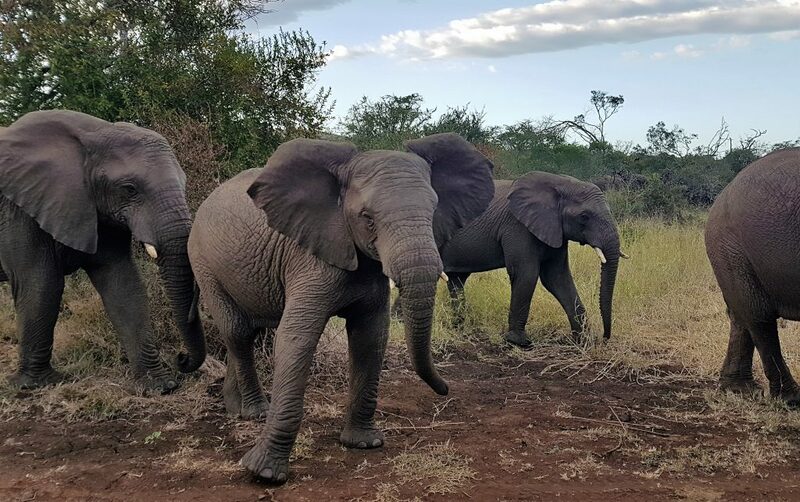 That the Zulu, Tswana and Tsonga names for the elephant all mean ‘the forceful one’, ‘the unstoppable one’… and that in Zulu the name for an elephant is indlovu, from the verb dlovu, which means to ‘crash through’, ‘to pierce savagely’. 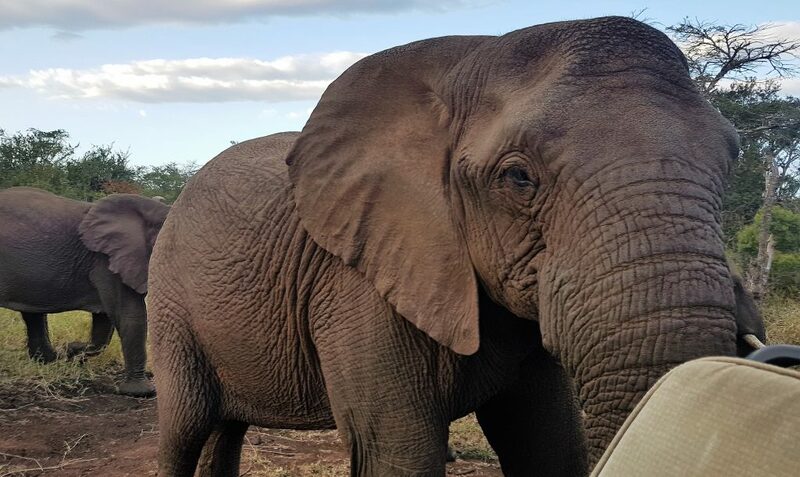 I too now have a great respect for the elephant, whose large form could so easily have ‘crashed through’ our vehicle and ‘pierced us so very savagely’. So much respect for these incredible creatures and for the rangers and guides who make these memorable experiences possible. 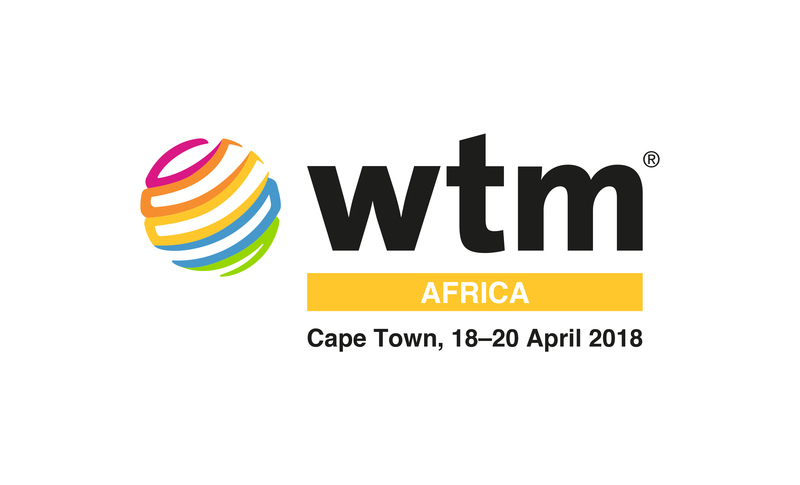 BOOK NOW for their SOUTH AFRICAN and SADC MEMBER SPECIAL RATES – offering 40% off their rack rates!! 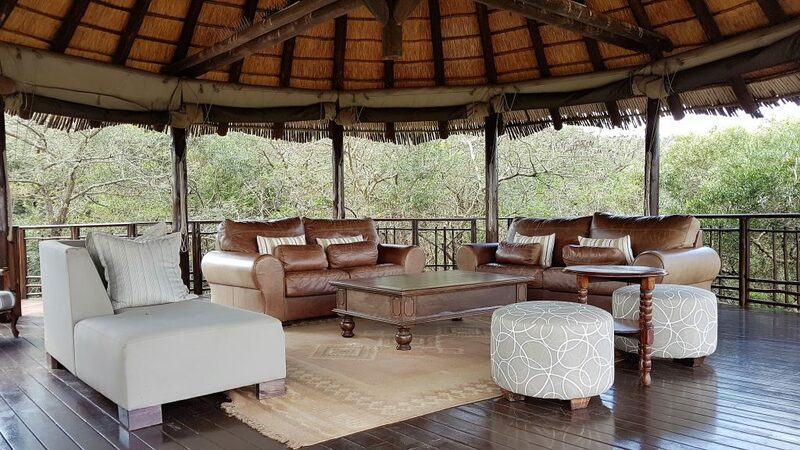 And if Thanda Tented is fully booked then ask for Thanda Safari Lodge… you won’t be disappointed! !